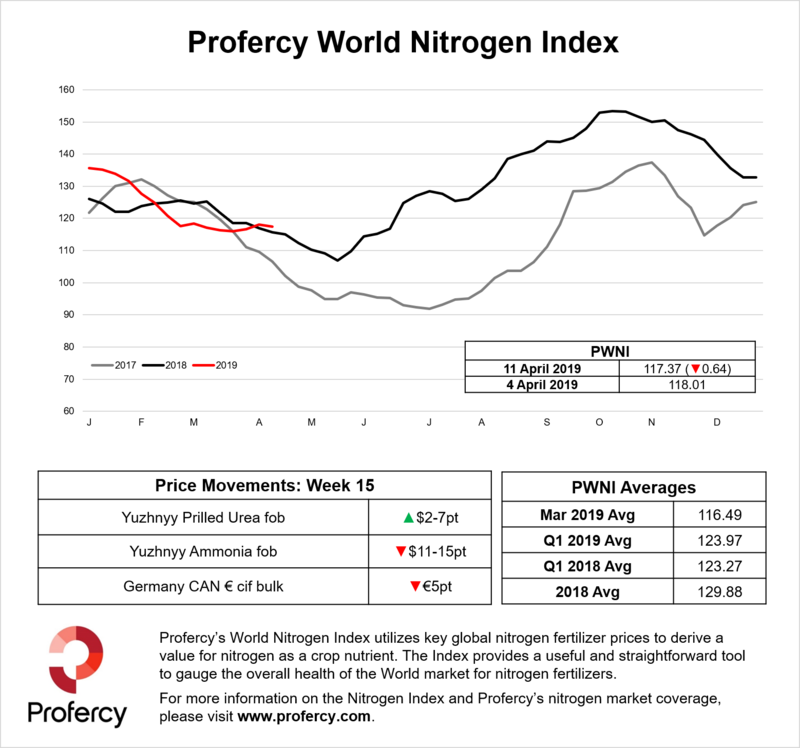 Profercy’s Nitrogen Index utilizes key global nitrogen fertilizer prices to derive a value for nitrogen as a crop nutrient. The Index provides a useful and straightforward tool to gauge the overall health of the World market for nitrogen fertilizers. For the latest detailed market analysis on global urea, ammonia, nitrates and ammonium sulphate, you can sign up for a no-obligation trial of the Profercy Nitrogen Service. To do so, please click here. Ammonia and UAN prices continued to decline and dragged the Profercy World Nitrogen Index lower even as most key urea prices remain stable. As a result, the Index declined by 0.64 points week on week to 117.37 points following two consecutive weeks of gains. The weakness in the ammonia markets is leading to talk of production cutbacks to ease production pressure. The Yuzhnyy ammonia price moved below $240pt fob. Production cutbacks may need to be considered for UAN with the recent rulings by the European Commission on UAN tariffs disrupting traditional trade flows and significantly increasing supply in the USA. Elsewhere, urea prices consolidated recent modest gains despite the volume booked in the latest Indian tender being smaller than expected at 375,000t. This in large part due to expectations that India will tender again in May despite the current, and ongoing, elections in India. In the meantime, Arab Gulf producers are not under pressure with the latest Indian tender affording an opportunity to consolidate prices over $245pt fob. In Egypt, prices were unchanged with top off sales reported above $260pt fob. A significant portion of May availability has already been committed to traders on formula. Other regions in the west are muted and largely directionless while appetite in China for imports now appears to have waned. Further analysis on eastern urea demand is available here. For a detailed overview of the latest developments in global nitrogen markets, as well as the latest regional market analysis and price assessments, you can receive a free trial of the Profercy Nitrogen Service. The Index is updated each week. An overview of the methodology can be found here. Get notified direct to your inbox whenever we update the Profercy World Nitrogen Index. Unsubscribe at anytime. No charges apply. To coincide with the publication of Profercy’s latest long term report, an article outlining urea price developments since the 1970s and the factors causing the decline in urea prices since 2011 can be found here. Copyright © 2019 Profercy Ltd | Registered in England & Wales. Company No. 03220009. To receive a free copy of our latest market reports, including fertilizer price ranges, please provide your email address.